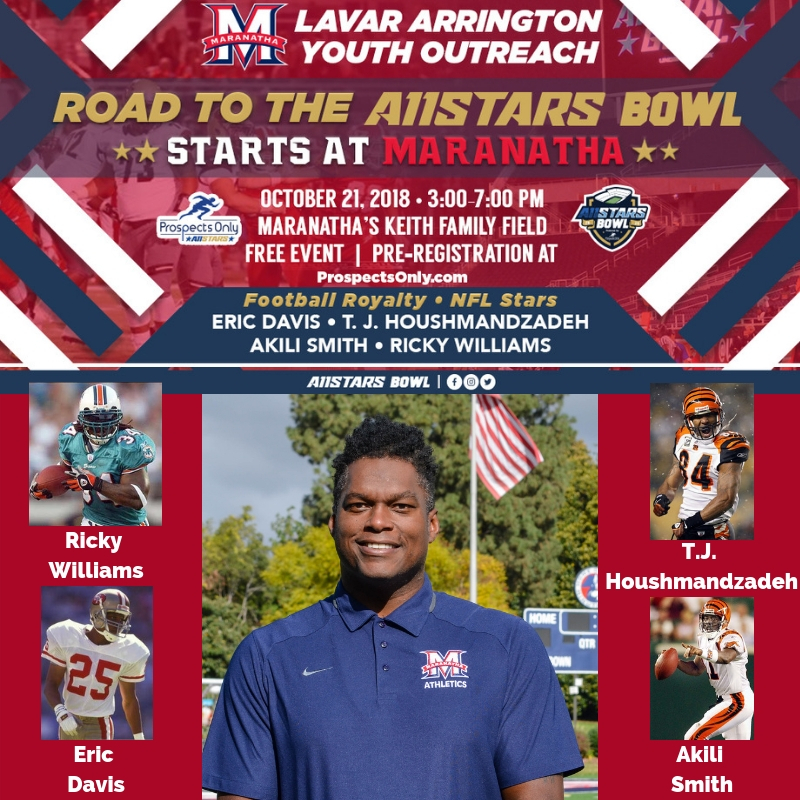 Coach LaVar Arrington and Maranatha High School, along with four former NFL greats, invite you to attend a free football camp on October 21 from 3:00-7:00 p.m. at the MHS Keith Family Field (169 S. Saint John Ave. Pasadena CA 91105). This camp is open to all 6th, 7th, and 8th grade football players but will be limited to the first 60 per grade level. This event is also associated with the AllStar Bowl and invites may be given out to attendees that are selected by the staff. For registration, please visit www.ProspectsOnly.com. Check in begins at 2:00 p.m. and parents are encouraged to attend with their child. For more information, contact LaVar Arrington at l_arrington@mhs-hs.org. Follow the event on Instagram at LaVar Arrington (king_of_the_mammals) and on Twitter at @WeAreMaranatha.